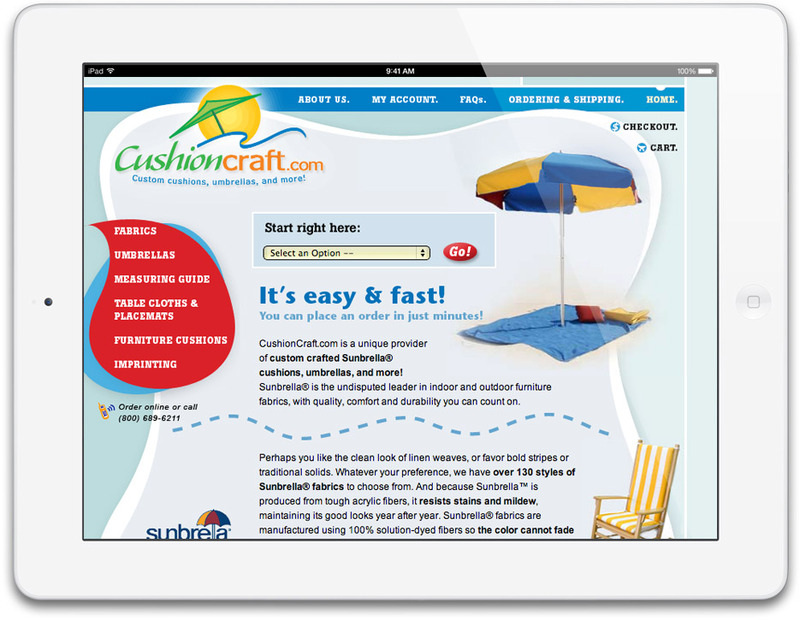 CushionCraft was an online lawn furniture company with a single location in Niles, Michigan. The year was 2003 and the owners noticed that their customers were repeatedly asking for custom cushions sized to fit their specific furniture. That’s how CushionCraft was born. The cushion market is crowded and giving people a way to order cushions with the click of a mouse, without difficulty, was our goal. To save development time and to keep costs down, we were able to implement an e-commerce shopping cart system as the base for the CushionCraft web store. It provides functionality that enables CushionCraft to create products that can be customizable by shoppers. Shoppers can choose from hundreds of fabrics, select cushion thickness, and enter dimensions all from a user friendly interface. The client wanted to create a unique look and feel for the site that evoked quality and at the same time had its own personality, which would help CushionCraft gain recognition. To achieve this, the new site says “we’re different” by using a playful design combined with unique shapes, colors, and content. On the homepage, we integrated a unique “starting point” that visitors can use to select a task. It gives task orientated users an immediate starting place that doesn’t force them to think. In just a few months of launching, revenue from the site paid for its complete development and the web site ranked well for common search terms. The web site was eventually merged into another business, and the web site was shut down due to the changing nature of the business.